Ricky Eugene Reuschel (pronounced Rush-al) (born May 16, 1949) is an American former professional baseball player. He played as a pitcher in Major League Baseball from the early 1970s into the early 1990s. His nickname was "Big Daddy" because of his portly physique. He was known for his deceptive style of pitching, which kept hitters off balance by constantly varying the speeds of his pitches. Reuschel was listed as 6-foot-4 and 225 pounds. Reuschel could run surprisingly well for his size (logging 4 triples in his batting career) and he was frequently used as a pinch runner on days he was not pitching. He was also a fair—though awkward-looking—hitter, batting well over .200 several times. His older brother Paul Reuschel also pitched for the Cubs for a few years while Reuschel was pitching, but was not nearly as effective as his younger brother and his career was much shorter. Both of them were Illinois farm boys, with strong physiques and plain-spoken ways. The two are the only siblings to combine on a shutout. 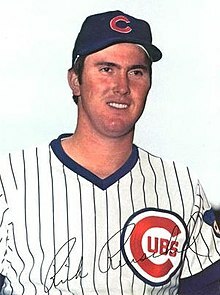 On August 21, 1975, Rick started and went 6⅓ innings against the Los Angeles Dodgers, followed by Paul, who pitched the final 2⅔ innings for the Cubs' 7–0 win. Reuschel began his Major League Baseball career when he was drafted in the third round of the 1970 Major League Baseball draft by the Chicago Cubs, at a time when they were declining in the post-Durocher era, and provided a strong arm for the Cubs' increasingly mediocre staff. After spending two years in the minor leagues, he joined the Cubs' major league team in 1972. His best season was in 1977, when the Cubs made a brief run at the pennant. Reuschel won 20 games and finished third in the Cy Young Award voting behind Steve Carlton and Tommy John. In addition, Reuschel pitched in a memorable game for Cub fans on July 28, 1977, when making a rare relief appearance on two days' rest, he entered the 13th inning of a 15–15 tie between the Cubs and the Cincinnati Reds at Wrigley Field. Reuschel retired two batters to end the top of the 13th. Then, he singled and scored the game-winning run in the bottom of the 13th, also picking up the victory in the 16–15 contest. Reuschel was signed by the Pittsburgh Pirates in 1985 as a free agent, and had a 14–8 win-loss record with the last-place Pirates, earning him the National League's Comeback Player of the Year award. The Pirates traded Reuschel to the San Francisco Giants in late 1987 for Jeff Robinson and Scott Medvin. Reuschel, finally back with a contender, became the ace of the Giants' staff and helped them make a late run to the National League Western Division title, their first division title since 1971. He followed that season by winning 19 games for the Giants in 1988. In 1989 at the age of 40, Reuschel was selected as the starting pitcher for the National League in the 1989 All-Star Game, and gave up a lead off home run to Bo Jackson, followed by Wade Boggs' home run to start the game. Reuschel finished the 1989 season with 17 wins for the Giants as he helped lead them to the World Series (their first since 1962). In the 1989 World Series, Reuschel was the losing pitcher in Game 2 with an 11.25 ERA, five earned runs, and five hits given up against the Oakland Athletics. In a nineteen-year major league career, Reuschel compiled a record of 214–191 in 557 games (529 starts). He had 102 career complete games and 26 of those were shutouts. He allowed 1,330 earned runs and 2,015 strikeouts in 3,548 and 1/3 innings pitched. Reuschel was a two-time Gold Glove Award winner and a three-time All-Star. Reuschel is tied for 90th with Mark Buehrle on the all-time wins list. Reuschel won the Hutch Award in 1985, and was also a winner of Sporting News Comeback Player of the Year Award. Reuschel was named to the Baseball Digest 1972 Rookie All-Star team. This page was last edited on 27 December 2018, at 08:36 (UTC).